CASE REPORT: Conservative care and axial distraction therapy for the management of cervical and lumbar disc herniations and ligament laxity post motor vehicle collision. Title: Conservative care and axial distraction therapy for the management of cervical and lumbar disc herniations and ligament laxity post motor vehicle collision. Abstract: This middle-aged female was injured in a vehicle collision causing her to sustain disc and additional ligament injuries in the cervical and lumbar spine. Diagnostic studies included physical examination, orthopedic and neurological testing, lumbar MRI, multiple cervical MRI’s, CRMA with motion cervical radiographs and EMG studies. Typically, conservative care is initiated prior to interventional procedures, and this case study seeks to explore the usage of passive therapy for mechanical spine pain and noted anatomic disc lesions after failure of interventional procedures. She reported both short term and long term success regarding pain reduction along with improvement in her activities of daily living after initiating conservative care, and continued to report further reductions in pain with periodic pain management using conservative care. Key: MRI (magnetic resonance imaging); EMG (electromyography study); CRMA (computerized radiographic mensuration analysis); CT (computerized topography); PTSD (Post-traumatic stress disorder); PRN (as needed); VAS (visual analog scale); HVLA (high velocity low amplitude). Introduction: The 49-year-old married female (Spanish speaking patient) reported that on March 4th, 2014 she was the seat-belted driver of a truck that was struck by a much larger fuel truck changing lines, hitting her vehicle at the front passenger side (far side, side impact). The force of the impact caused her truck to be lifted up and the right wheel popped off. Her head hit the window after impact and the spinal pain and complaints started approximately 24 hours later. Two days after the crash she went to the emergency department. Occupant pictures were taken describing an out of position occupant injury. She did not report any additional significant trauma after the collision. Prior to her evaluation at our clinic, she utilized multiple providers for diagnosis and treatment over the course of 11 months. She went to the emergency department, utilized 3 pain management medical doctors, neuropsychologist and a cognitive rehabilitation therapist. Imaging included radiographs and MRI of the right shoulder revealing rotator cuff tear; radiographs of the lumbar and thoracic spine, and left hand; CT of the head and cervical spine were performed; MRI cervical (3) and lumbar spine. Medications prescribed included Fentanyl, Percocet, Naprosyn, Cyclobenzaprine, Norco, Hydrocodone-acetaminophen, Soma, and Carisoprodol. Physical therapy was provided for spinal injuries and she did not respond to treatment. The neurosurgeon recommended epidural steroid injections and facet blocks. Cervical nerve blocks and cervical trigger point injections, cervical and lumbar epidural steroid injections (ESI), lateral epicondyle steroid injections were performed, none of which were palliative. Post-concussion disorder and PTSD with major depressive disorder were diagnosed. On February 12th, 2015, she presented to our office with neck pain (average 6/10 VAS) that affected her vision, with paresthesia’s in both upper extremities radiating to the hands with numbness. She had low back pain (average 6/10 VAS), and she additionally reported paresthesia at the plantar surface of feet bilaterally. She had left elbow pain, right shoulder pain, knee pain, headaches and “anxiety” along with anterior sternal pain. Her injuries were causing significant problems with her activities of daily living. Summarily she had increased pain with lifting, increased pain and restricted movement with bending, walking and carrying. She had been unable to perform any significant physical activity from the time of the crash in March 2014 until March 2015. Her right hand was always hurting and her forearms. She was not able to clean windows or do laundry, difficulty using stairs, problems with mopping, ironing and cleaning. She had to limit her walking and jogging primarily due to neck pain and right arm pain. She was not able to sit for long periods of time and sleeping was disrupted due to numbness in her hands. She was only able to walk on a treadmill for 10 minutes before having to stop due to pain, prior to the crash she would exercise for an hour. Prior History: No significant prior musculoskeletal or contributory medical history was reported. Clinical Findings (2/12/15): She had a height of 5’2”, measured weight of 127 lbs. Visual analysis of the cervical spine revealed pain in multiple ranges of motion including flexion, extension, bilateral rotation and bilateral side bending. On extension pain was noted in the upper back, on rotation pain was noted in the posterior neck, and on lateral flexion pain was noted contralaterally. Visual analysis of the lumbar spine revealed pain in the low back on all active ranges of motion, including flexion, extension and side bending, pain primarily at L5/S1. Dual inclinometer testing was ordered based on visual active range of motion limitations with pain. Sensory testing was performed of the extremities, C5-T1 and L4-S1. No neurological deficits other than right sided C5 hypoesthesia. Foraminal compression test produced pain in the cervical spine. Foraminal distraction test caused an increase in pain in the neck. Jackson’s test on the right produced pain bilaterally in the neck. Straight leg raise bilaterally produced low back pain, double Straight leg raise produce pain at L5/S1 at 30 degrees. Muscle testing of the upper extremities was tested at a 5/5 with the exception of deltoid bilaterally tested at a 4/5. The patient’s deep tendon reflexes of the upper and lower extremities were tested including Triceps, Biceps, Brachioradialis, Patella, Achilles: all were tested at 2+ bilaterally, equal and reactive. No evidence of clonus of the feet and Hoffman’s test was unremarkable. C3-C5 right sided segmental dysfunction was noted on palpation. T5-T12 spinous process tenderness on palpation. Low back pain on palpation, particularly L5/S1. Dramatic reversal of the normal cervical curvature, apex C5/6. C5/6 herniation, indentation of the spinal cord anteriorly. High signal posterior on STIR. Due to the angular kyphosis of the cervical spine and axial slices performed, C6/7 slices did not render a pure diagnostic image for disc disruption. Reversal of the normal cervical lordosis. C5/C6 herniation (extrusion type) with indentation of spinal cord, appropriate CSF noted posteriorly. C5/C6 disc protrusion, anterior cord abutment, thecal sac involvement. IMPRESSIONS: C4/5 herniation noted on 10/24/15 was not noted on prior images. 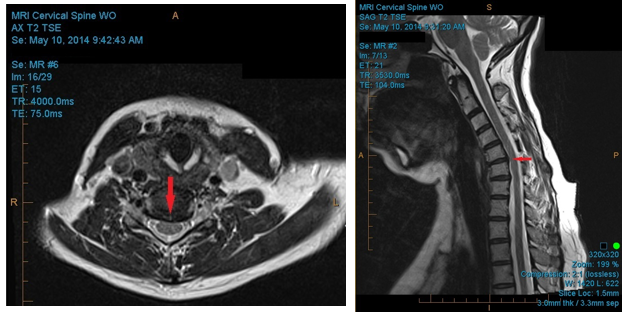 The patient reported no additional injury or symptoms between MRI studies, so it is postulated that initial slices revealed a false negative; or due to the severity of abnormal cervical biomechanics, it is possible that the C4/5 disc herniated between the pre/post MRI’s with no significant increase in symptomatology. There was improvement at C5/6 related to disc abnormality and cord involvement (see below). The cervical flexion/extension images were digitized February 2016 and interpreted by myself and Robert Peyster MD, CAQ Neuroradiology, revealing a loss of Angular Motion Segment Integrity at intersegment C6/C7 measured at 19.7 degrees (maximum allowed 11 degrees), indicating a 25% whole person impairment according to the AMA Evaluation of Permanent Impairment Guidelines 5th edition1. CRMA provided from Spine Metrics, independent analysis. Evidence of significant ligament injury causing functional subfailure was measured at C3/4 at 10.4 degrees and at C4/5 measuring 10.9 degrees regarding angular motion. Abnormal paradoxical translation motion measured at C6/7 and C7/T1. EMG of the upper extremity revealed bilateral C6 radiculopathy, December 16th, 2015. Conservative treatment rendered: A neurosurgical referral was made for assessment and surgical options. Conservative care was initiated despite failure of other medical procedures since there is “further evidence that chiropractic is an effective treatment for chronic whiplash symptoms”2-3. The patient was placed on an initial care plan of 2-3x/week for 5 months, with a gap in passive care for 1 month. 23 chiropractic visits. Instrument adjusting cervical spine was utilized with Arthrostim. Non-rotatory HVLA (high velocity low amplitude) spinal adjustments were performed thoracic and lumbar spine, applied A-P. No HVLA spinal adjustments to the cervical spine. Prior to being placed at maximum medical improvement she had persistent low back symptoms, continued tingling in the fingertips and occasional neck pain at a 4/10, with her upper extremity paresthesia’s improved 50%. She continued with pain management chiropractic care after MMI, approximately 1 visit every 3-4 weeks with axial distraction to the cervical and lumbar spine, chiropractic adjustments as needed (PRN). 2 years/9 months post collision, and 1 year/9 months after initiating conservative care at our clinic, she reports only slight (1-2/10 VAS) spinal complaints with her primary concern being a torn rotator cuff injury from the crash that still requires surgical intervention. After initiating care at our clinic, no other interventional procedures were performed, although medication usage persisted. Due to improvement in symptoms and functional status, spinal surgery was not considered. She still utilizes Aleve PRN, 1-2 tablets. No significant active spinal rehabilitation was utilized. The patient was given at home active care consisting only of cervical and lumbar stretches, walking, and ice to affected areas. Conclusion:While chiropractic care is safe even in the presence of herniations and radicular symptoms, “the likelihood of injury due to manipulation may be elevated in pathologically weakened tissues”4. Due to cord involvement, the provider decided to utilize low force procedures although HVLA spinal adjustments to the cervical spine could be considered safe due to lack of cord compression. HVLA spinal adjustments A-P were utilized in the lumbar and thoracic spine not only for short term pain relief but also as part of managing the chronic low back pain secondary to ligament/disc damage. While previously theorized to be only episodic, low back pain can be a lifelong condition requiring patients to seek ongoing care5. This care can be active, passive, pharmaceutical, interventional, or conservative in nature, but ongoing pain management therapy is often required for permanent ligament conditions. There is clear benefit to the patient population to be able to avoid surgical intervention due to risks, costs, ongoing prescription medication usage and adjacent level degeneration in the future6. Avoiding opioid usage is also a high priority in today’s environment. Long term conservative care utilizing instrument spinal adjusting and targeted axial distraction therapy significantly reduced subjective reporting of pain, increased activities of daily living, and allowed the patient to avoid further spinal injections or surgical intervention. Considering that various interventional procedures failed prior to conservative care, it is important that providers work in an interdisciplinary environment such that the safest, and in this case the most effective, therapies are utilized first to reduce risk to the patient and maximize benefit and reduce costs. 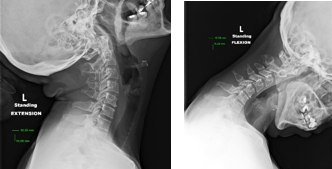 In this case study, the patient utilized multiple pain management physicians, cervical nerve blocks and epidural steroid injections, and was not directed to conservative care for 11 months post injury. Utilizing chiropractic as conservative care would have enabled this patient to regain function and decrease pain while reducing costs and risks that are associated with medications and interventional procedures. Competing Interest: There are no competing interests in the writing of this case report. Cocchiarella L., Anderson G. Guides to the Evaluation of Permanent Impairment, 5th Edition, Chicago IL, 2001 AMA Press. Khan S, Cook J, Gargan M, Bannister G. A symptomatic classification of whiplash injury and the implications for treatment. Journal of Orthopaedic Medicine 1999; 21(1):22-25. Woodward MN, Cook JCH, Gargan MF, Bannister GC. Chiropractic treatment of chronic whiplash injuries. Injury 1996;27: 643-645. Whedon J, Mackenzie T, Phillips R, Lurie J. Risk of traumatic injury associated with chiropractic spinal manipulation in Medicare Part B beneficiaries aged 66-99 years. Spine, 2015; 40:264–270. Hestbaek L, Munck A, Hartvigsen L, Jarbol DE, Sondergaard J, Kongsted A: Low back pain in primary care: a description of 1250 patients with low back pain in Danish general and chiropractic practices. Int J Family Med, 2014. Faldini C., Leonetti D., Nanni M. et al: Cervical disc herniation and cervical spondylosis surgically treated by Cloward procedure: a 10-year-minimum follow-up study. Journal of Orthopaedics and Traumatology, June 2010. Volume 11, Issue 2,pp 99-103.